Part 3.2 The Waddingtons/Hasbro Additions. 61222 - 61240 (plus Hasbro number re-use). The Continental Range (C100-C110); (C111-C120); (C121-C139); (C140-C169); (C170-C191). At this point, my knowledge of the accessory range enters a bit of a dark age. I was still buying second hand stuff in the late 1990s, but I'd given up the new range as an expensive retread of the old one (with extra advertising). Perhaps this is a little unfair. The range numbers get to 61240, but I'm not sure all these numbers were really used. In a development that has mucked up my lists (! ), Hasbro re-used a couple of numbers, 61125, and 61133. These have been added to the end of the range listed here. 61222 Two Greek Pillar Style Floodlights. These were the cool new floodlights that appeared circa 1991. Unlike the earlier floodlights, these were battery only, not mains adaptable. The battery chamber is accessed via a small and annoying screw. Where is that screwdriver when you need it? Once the batteries are in place, the floodlights give out a rather vague glimmer of light. Having said that, they were probably the most attractive floodlights produced, and much more stable than previous sets. 61223 Three Umbro Elite balls. These rather nice Umbro balls first appeared on the 1992 poster (see below) where they replaced the Samba balls. They then stayed in the range until 1995, before being used up in the assorted ball pack (61233). I've also seen them in 1997 "Club Editions" in place of the green logo balls. After a period of producing A4 catalogues, 1992 saw a return to posters to illustrate the range. Whilst a catalogue was usually included in boxed editions of the game, this one was also sold separately. Mine still has a "20p" price tag from the Gamleys in Worthing where I originally bought it. A big thank you to Dimitrios who spotted the bar code on the 1995 catalogue (see below) and made me check back all my old catalogues to see if they filled any gaps in the range. This is the only other bar coded item I found. 61225: Three USA '94 balls. All I can really say about this one is that it is issued in an eye-catching box. Oh and they feature on the 1993 poster. These were simply the Italia '90 goals with different coloured nets (red, white and blue, rather than green, white and red). They replaced those goals in the range in 1993. The USA '94 goals and balls were also included in the USA '94 boxed edition. 61227: 1993 and 1995 Poster catalogues. Like 1992, these catalogue had a bar code with an accessory range number. The 1995 version turned out to be the last poster to feature a full range of accessories. The 1996 poster was the last one produced, and although it is similar in design, it doesn't have a bar code (nor does 1994). Thanks to Dimitrios who supplied this catalogue, and spotted the bar code. Ever since this accessory list was started in 1999, there were unexplained gaps in the numbering of the mid-1990s. It seemed like Waddingtons/Hasbro were either suddenly using numbers randomly, or items had been designed, but not produced. Finally though, a 1995 "preview" catalogue has come to light. This catalogue showed the new licensed Subbuteo products that were being planned for both Euro '96, and the FA Premier League. The catalogue showed prototype designs of boxes for both ranges, and revealed that the items eventually sold as combined sets 61234 and 61235 were originally going to be released separately, using many of the reference numbers missing from the accessory list. Do these goals look a little like the Italia '90 ones to you? And the USA '94 ones? Same goal, different colours. I've also included a picture of the box of this item, because I rather like the Euro '96 design. 61230: Three Euro 96 balls (unreleased). The first of the unreleased entries from the 1995 catalogue, this was a set of balls in an attractive Euro 96 design. Sadly, in contrast, the actual Euro 96 balls (shown below in 61235)were a really boring design. I'm sure the balls shown here would have been a much more successful product (but perhaps they were too difficult to produce). This weird and colourful design work now only exists on the Euro 96 boxes. December 2012:- I've added a picture of an actual Euro '96 prototype ball half, which was sent in by Paul Scatchard. Nice to know that a couple of these were produced. 61231: Three Premiership Mitre Delta Balls (unreleased). The decision to put Premiership balls into the Premier League box sets, and the accessory pack (61234) make these balls easy to acquire. A simple three ball box set was never released though. 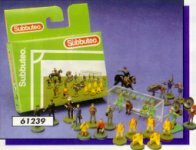 Subbuteo had lots of these sets in their range of the early 1990s, but perhaps they just were not selling enough to justify adding more. Indeed, Hasbro dropped the concept in 1996 in favour of a simple five ball bubble pack. Also shown here is the prototype packaging for the three small Premiership sets. Like the Euro '96 balls prototypes are again shown here, although this time the finished product stuck closely to their design. The word "Delta" was replaced by the words "Premier League" and pleasingly, the eventual product was sold in different colours (see 61234 for details). 61232: Premiership Referee and linesmen (unreleased). 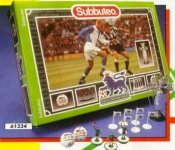 As with the balls, the Premiership referee set was not released individually, but found its way into both the Premiership box sets, and the accessory pack (61234). The referees here do have a lighter green shirt than the production line, but there is not much else I can add. 61233: Six Premiership Flags (unreleased). 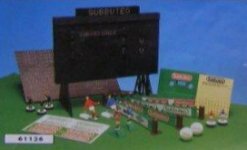 This was the third and final "small box" accessory planned in the Premiership range, and like the balls and refs, the flags finished up in set 61234, and in the Premiership sets. This would have been the first set of licensed flags produced. Although Euro '96 flags were also produced at this time, the 1995 catalogue does not show them. The early 1990s accessory range had seen a large number balls with advertising from different ball manufacturers. These balls were sold in boxes of three. By 1996 these boxes had disappeared from the range, and the remaining unsold balls appeared as a random assortment in this bubble pack. The most common balls in these packs seem to be Mitre Deltas, Umbro Elites, and Adidas Tangos (in white). The original Hasbro version of this accessory was sold in a pitch-corner style bubble pack. And the Hasbro balls refill pack of 2002 also used this number (see the bottom of this page). 61234: The Premiership Accessory Pack. A large box containing a big piece of black plastic with a few accessories poking out of it :-). I'm not sure why I'm so harsh to this set, but at the time it just seemed poor value for money. The set contains all the extra bits also in the Premiership Boxed Edition. It has the trophy (also available as 61125), six flags, referees in green, and two balls. Nice variations, but the box could have been half the size, and the price a little lower (I think it was about �12.). As a little extra for anyone who likes to collect balls, the Premier League balls in my Accessory Pack have green and red logos, whereas the two in the Premier League Box Set are both blue. In addition, the one cut in half in my version of the Premiership Squads game has black logos. So potentially there are several to collect. 61235: Euro '96 Balls and flags. A simple little tie-in set designed to add that Euro '96 fever to any Subbuteo set up. Useful if you'd already sat on your original pitch flags. The set actually had two different boxes, a Waddingtons one as scanned above and a Hasbro one, which was slightly wider and longer, but much flatter and with a large hanging tag. In fact, the second box is the same shape as the 61239 box illustrated below. As you can see from the picture, this was a set combining five "stand around the pitch" sets. Or more accurately, the three sets that had already combined since 1986 as 61214, plus the bench set 61139, and the cameramen from 61208. Shown in the 1996 catalogue only. This final set from 1996 was another combination of earlier items. This time it was the referees (61107), and the small flags (61188), in their orange incarnation. This is a little unexpected. For years, this team has sat in the team lists under reference 63246, although it was also sold under 63016. However, an eagle-eyed collector has noticed that the box has this listed as 61246, which clearly places it in the accessory range. This is not without precedent of course, as the England team was also specially boxed as C138 back in the mid-1970s. Well done to Andrew Mackay for flagging this up. Here is the Premier League trophy from 61234 available separately in a bubble pack. It was a small trophy compared to the old favourites, but was quite attractive, with a tiny green plinth. Certainly an improvement on the European (Champions League) trophy. I've no idea why it was issued as 61125 instead of one of the seemingly unused numbers in the 61200s. 61126: Essential Accessory Pack (unreleased). This is the final unreleased accessory from the 1995 catalogue. It follows the strange 61125 numbering of the Premiership trophy, but does not aid in our understanding of this glitch in the numbers. The picture suggests that this pack contained a scoreboard, a fence, corner kickers, throw-in figures, the referee set, two balls, two spare players (one red and one blue), and the number transfers. Oh, and strangest of all, there is a green cassette tape with a Subbuteo logo on it. What was this for? 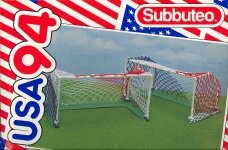 Surely not a dance remix of the Subbuteo World Cup song? The pack was placed on the Euro 96 page, but there does not seem to be a link with that range. Admittedly, the Euro 96 set is shown with a black scoreboard (as opposed to the blue board it was issued with), but the balls here are from the standard set. 61133(b): Two throw-in and two corner kick figures. Another bit of number re-use as Hasbro reissued the corner kick figures and throw-in figures once again, but this time in a double pack. With the corner kickers previously 61131 and the throw-in figures at 61132, it made some kind of sense having the double pack as 61133, but there had already been a 61133. The interchangeable goalkeepers having survived well into Waddingtons' re-numbered range. Corner kick and throw-in figures from the France 98 edition. These figures were never produced as a separate accessory, and do not appear in any of the newer box sets, so the France 98 edition was their only appearance thus far. Hopefully, you can see from the above illustration how these items operated. They were a very simple design, but worked quite well. The corner kicker doesn't get as much power as the old one, but doesn't really need it, and it benefits from being the correct scale. The throw-in figure is just a goalie, but you could paint him to match a team without too much trouble. He gives quite a delicate throw-in, but at least you don't get any back spin. One of the more interesting Subbuteo items to pass through ebay was a pre-production sample box for this set, as illustrated above (right). This shows that Hasbro were considering releasing these figures as a separate set. The see-through bases on the box are an obvious difference to the items as actually produced. I would imagine that the separate accessory plan would have pre-dated the World Cup 1998 set, and that set may have even been using up the stock. 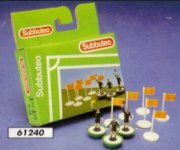 Subbuteo was not in good health in the mid-1990s, and I suspect a new accessory was not deemed worthwhile. It would be nice to get some inside information on this one though. Was it planned prior to the 61133 set shown above for instance? Sadly, one thing this box was lacking was a reference number. Referees from the Premiership Editions. Like the special corner kick/throw-in figures, these were a new accessory only found in boxed editions. The early Waddingtons Premiership Editions had the old style referees (C107), but painted into green jerseys. However, the final two "deep-box" editions had these new referees, who had fine detail and machine-printed shirts. As you can hopefully see, the figures were on a larger round peg, which sat on top of the Hasbro bases, rather than within them. The size is slightly bigger than OO scale, and I have always wondered if they were actually designed for Subbuteo. Hasbro also owned rival game "Pro-Action football", and these figures look better scaled to that game (although the tall Pro-Action bases would have towered over them). 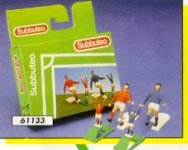 The figures resurfaced when Edilio Parodi produced a licensed version of Subbuteo in the early 2000s. These later referees were produced in a variety of colours, to match the options open to officials in the 21st century. As Parodi were using two-piece bases, the referees were amended so that they were moulded onto a larger disc, which fitted into the standard Subbuteo outer. This set also included a fourth official holding up a board, although he is not such a fine quality figure as the other three. This was the first accessory in the new Hasbro range. 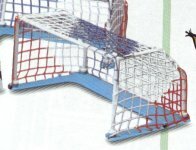 These goals also appeared in the France 98 set, and the 2002 boxed range. They came flat-packed in kit form. The nets were shaped to the goals rather than flat, but needed to be looped around the posts to fit. This does secure the net pretty well, but detracted from the overall look of the goals. The bases are the largest yet, and have a back bar that keeps goal and net away from the goalkeepers rod. The disadvantage to this is if your opponent produces a chip shot, you can't get the goalkeeper high enough to save the shot. Doh. Hasbro Balls refill Pack (61233). The second accessory in the Hasbro range was a pack of five balls. Actually, this set was technically numbered up as a second version of 61233, but here all the balls were just the same with each having a red Subbuteo logo. You seem to have reached the end of the Subbuteo Football range. Go back to the main page if you want to look at something different. (The rugby and cricket accessory ranges are now available).